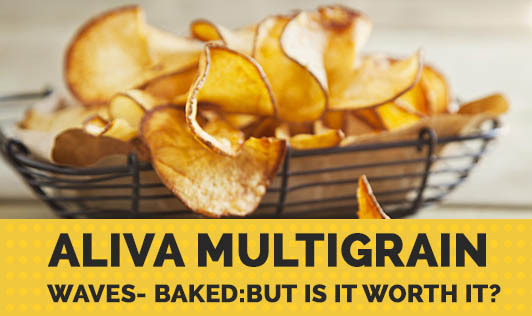 Aliva Multigrain Waves- Baked: But Is It Worth It? Aliva multigrain waves claims that they give you light & crispy baked snacks in unique combinations and the goodness of multi-grain cereals like wheat, oats, corn, and rice. They come in 2 delicious flavors- cream and herb and sweet chilly, and claim to make no compromise on the taste at all. The all new Aliva baked range is priced at Rs.15 for a 50g pack of Multigrain Waves and Milk Minis, 45g pack of Crispy Thinz, and 60g pack of the original Tasty Crackers. Wheat flour, lentils, vegetable oil, sugar , milk solids, spices (chilli powder, ajwain, pepper, fenugreek, garlic & onion powder, cumin, clove, capsicum, cinnamon, ginger & coriander powder), leavening agents, salt, emulsifiers, stabilizers, and dough conditioner. It also has necessary enzymes and acidity regulators. There are 4 flavors of Aliva available in the market. Classic salted, Tomato and Roasted spices, Mint with Herbs, and Special Pindi Masala. Each of these has a good combination of desi spices, herbs, and chillies that lend a perfect taste for the ones looking for a change from the boring plain crackers. Though the product claims to be baked, it is neither low in fat nor low in sugar, calories, carbohydrates, or sodium. The product doesn't have an impressive taste either. With the other unhealthy ingredients like sodium, sugar, and carbohydrates at a level with most other products of this kind, is there any advantage of this one being baked? In terms of suitability, this product may be eaten in moderation by a person who is in his ideal body weight range, while an overweight person may be able to eat this only once a while. On the other end of the scale, a person with any kind of chronic disease should preferably avoid this product. The product also claims to be made with wheat, corn, oats, and rice, which can result in a carbohydrate overload, a major drawback for weight loss. Also, the fat content of 20.2g for a 100g pack is more than the recommended amount of fat for an individual for a day. Read every label well before you buy them. All baked products are not low in fat and calories. Do not blindly buy a product just because it has an attractive offer or ingredient in it. They may just stop you from achieving your weight loss goal.